We’re well into the era where brands are playing the role of cultural curators. To manage all the info overload and noise, it’s great to see brands like Mulberry in the UK curating cultural content in a way that’s as equally beautiful as it is useful. Inspired by and created to support the UK government’s GREAT Britain campaign, it’s an amazing curation of what makes GB Brilliant. 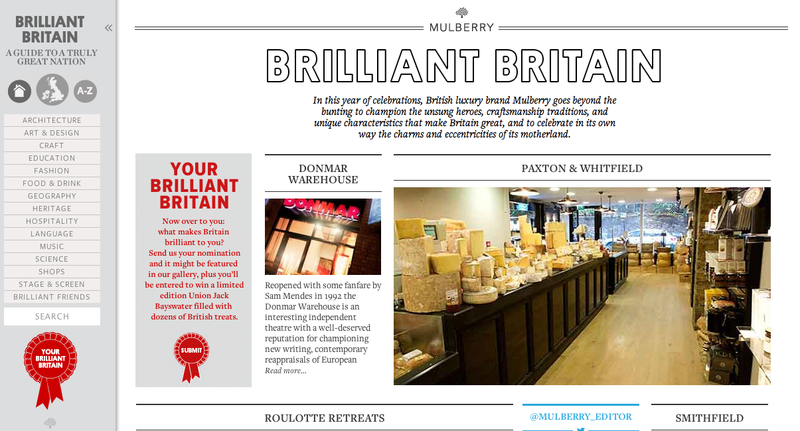 Check out Brilliant Britain, a great example of a brand playing a bigger cultural role in society that’s both meaningful and highly engaging. Well done. Nike are all over it when it comes to using the right people to help launch their products. The launch of Nike + Fuelband is another perfect example. They paid prominent YouTuber Casey Neistat (h’es got over 12,000 subscribers to his YouTube channel) to make a video about his experience with the Nike + Fuel band under the launch theme of #makeitcount. It’s a great piece of content that’s racked up almost 500,000 views in a few days. Great example of using the right influencers to help create content for you and spread the message. Notice the very subtle branding. Alot of brands try to use YouTube vloggers with mixed success. Here’s two examples of very different brands who have managed to capture the attention of youth culture in very different ways. Skittles went down the entertainment route, Crocs the educational route. Both are effective. Skittles knows how to use the ‘right’ influencers in the digital space to help drive UGC. They’ve been in touch with character Trale Lewous a few times before to get him to help them tell their rainbow story. In this instance they sent him a custom Skittles boom box and this is what he came up with. Over 750k views in a few days for the cost of a customised boom box. Brilliant, highly effective influencer content. Nice to see a brand who really gets how to use YouTube vloggers. The other brand who’s used infuencers really well is Crocs. They use ‘hollas’ (girls who create film reviews after their shopping experiences) in an orchestrated influencer campaign called ‘Crocs are cute’. They got 3 key hollas to review their latest translucent shoes for girls, asking them to go on a shopping spree to match outfits with the shoes. Relevant, meaningful, authentic. Really sweet idea for a brand that wouldn’t have any traction with the teen/20 something female audience. 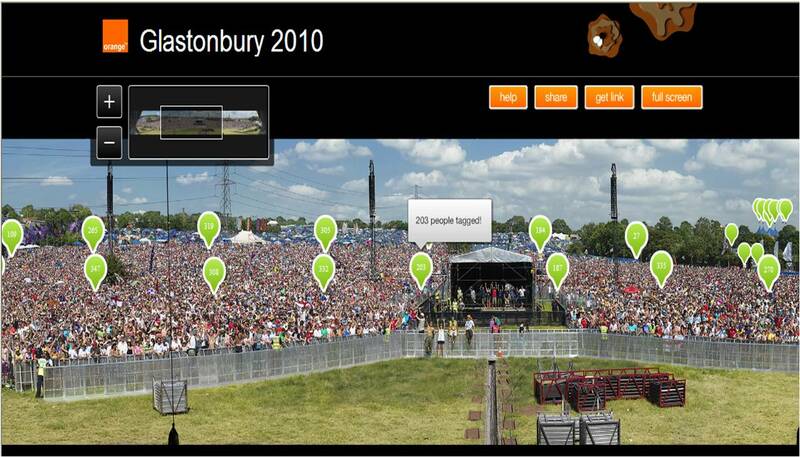 Simple but great idea from Orange UK who recently sponsored Glastobury 2010. Glastotag is a mammoth photo taken at half time during the England v Slovenia match from the Pyramid Stage at Glastonbury. They are trying to create the world’s most tagged photo ever. The thing I really like about this idea is that it taps into a two simple but powerful truths amongst festival rat youths, in that they love having their party pic taken at festivals. and they love tagging themselves. They’re creating a bit of culture with this idea, sure they’ve tapped into an existing event, but with this audience, you go to where the fish are- unless of course you’re Red Bull and you’re creating events yourself. One of my football buddies Joe was there and he said it was awesome, he’s still to find his head in the photo, but the great zooming features on the Glastotag make it pretty easy to spot yourself out. Great idea by Orange and nice Facebook Connect integration making it super easy to share with friends. As we all know, youth want to be part of the brands story, and this has been one of the better music festival integrations I’ve seen by a telco, as they genuinely have added value to the partygoers experience ,not just invaded the space.